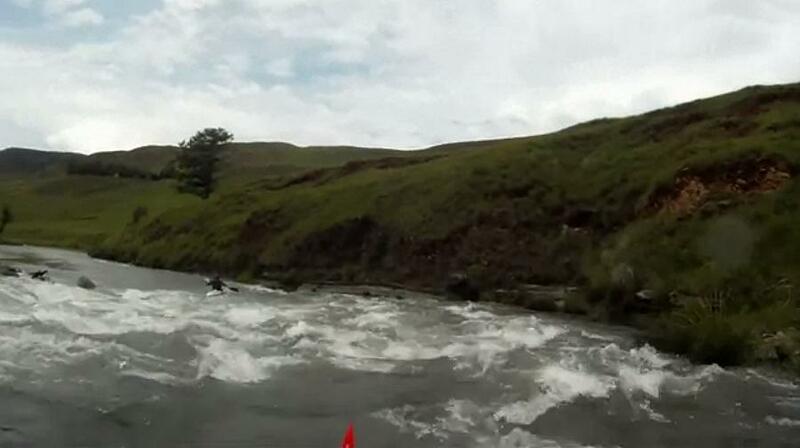 This is a wonderful long rapid with fun drops and waves that ends in a typical Umzimkulu sharp turn drop against a rock face. As always the water runs deeper on the outside of the turn, and the paddler can easily get washed against the rockface at the bottom of the rapid. As long as you don’t peg your nose, and lean into the rocks you can exit alright but it will be slow and awkward. There is always a central line that offers a smoother exit, and in full river conditions it is often possible to cut the corner altogether by taking an inside line.